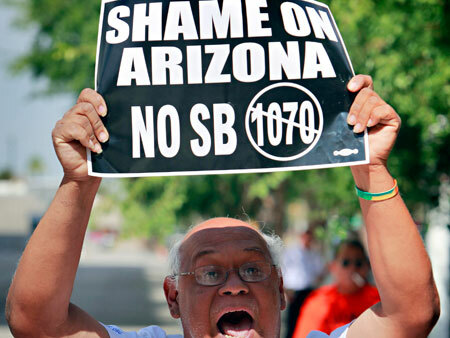 This week the Supreme Court will hear arguments on the constitutionality of Arizona’s anti-immigrant law, S.B. 1070. The law goes far beyond federal immigration-enforcement policy, making it a crime to be without status within the state and mandating that the police ask proof of legal status for anyone they believe to be in the country illegally. The law is designed to drive the undocumented out the country, pursuing a misguided strategy of attrition through enforcement, or self-deportation. But what would actually happen if the Court upholds the law? Here’s our list of unpalatable consequences. If the Supreme Court upholds provisions of S.B. 1070 such as the “papers please” requirement, it will by proxy allow the related provisions in anti-immigrant bills that have been put on hold in Alabama, Georgia, Utah, and South Carolina to go into effect as well. Even more ominous, the Court’s decision would give the green light to states such as Oklahoma, Kansas, Mississippi, Virginia, Missouri, and Tennessee, which have flirted with copycat bills, to move forward. If anti-immigrant bills are allowed to stand, the United States will once again find itself as a deeply divided nation, with some states welcoming immigrants and others rejecting them. Since no one can tell just by looking at someone if they have or do not have legal status—as legal scholar Lucas Guttentag points out—deciding who lacks status will likely be “based on their appearance, based on their ethnicity, based on whatever some local person may think is someone who is not a citizen,” a precursor to racial profiling and discrimination based on race. Every person in Arizona and states that pass S.B. 1070-like legislation will be required to carry proof of their legal status at all times or face the possibility of being detained. In practice it will be people of color that bear the brunt of these policies. Instead of focusing on keeping our communities safe, law enforcement professionals in states with anti-immigrant laws will be forced to divert from their core mission to detain unauthorized immigrants. As Sgt. Bryan Soller, president of the Mesa, Arizona, Fraternal Order of Police Lodge No. 9, puts it, “If we’re getting hammered with calls, is a misdemeanor [trespassing by an illegal immigrant] more important than a stabbing or shooting? No.” Likewise, immigrants who live in fear of anti-immigrant laws will be afraid to go to the police to report a crime, making all of our communities less safe. Anti-immigrant laws hit states in their pocketbook. In the first year after passing S.B. 1070, Arizona saw an estimated $141 million in losses from conference cancellations. The impact on the tourist industry from this first year alone totaled more than $250 million in economic output and close to 3,000 lost jobs. Georgia’s anti-immigrant law, H.B. 87, is estimated to cost the state between $300 million and $1 billion in lost agricultural output, while a University of Alabama report estimates that Alabama’s H.B. 56 will cost the state nearly $11 billion in economic damage annually. Decisions made by individual states affect U.S. foreign policy as a whole and when foreign nationals and foreign investors feel threatened, the United States as a whole suffers. The government of Mexico has already issued a travel warning to all Mexican nationals in Arizona, stating that they could be “bothered or questioned without motive at any time.” With 65,000 Mexicans admitted daily into Arizona, spending in total around $7.35 million each day, a Supreme Court decision that put the Arizona law in motion (it’s toughest provisions have been enjoined) could be seriously detrimental to the state’s and, by extension, our nation’s economy. Continuing to target foreign nationals may also impede international cooperation on effort to combat terrorism, drug trafficking, weapons smuggling, and human trafficking. And as Deputy Secretary of State James B. Steinberg attested to in his declaration before the U.S. District Court for the District of Arizona, the Mexican Senate has already postponed the review of an agreement with the United States on cooperative emergency management of natural disaster, citing the Arizona law as a reason to eschew cross-border work. The upshot: Instead of a patchwork of 50 state policies, we need the United States to speak with one voice on immigration. Instead of harming our economy, public safety, and foreign policy, we need policies that foster inclusion and growth. America as a nation was founded upon equality, not divisiveness. Arizona’s ‘Show Me Your Papers’ Law in the U.S. Supreme Court: What’s at Stake? Interactive Map: A Nation United or Divided?